Sport climbing areas are rock faces (rock walls) with bolted short routes. Access is ussually no longer than thirty minutes. On relatively small distance there are lots of routes of different difficulty grades which rarely have more than thirty metres in length. This is where sport climbers push limits of human climbing abilities higher and higher. 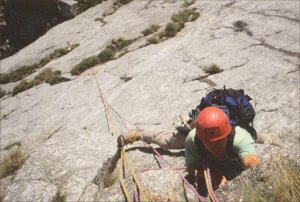 To alpinists this sport climbing areas serve mostly for training prior to make mountain ascents and are the place where they can safely test their own capabilities. What actually is climbing? Answer to this question can best be found exactly in sport climbing areas. They are the first contact to vertical in most safe and comfortable way. 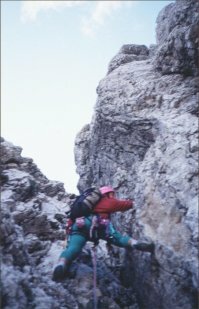 Here I organize courses of sport climbing and preparation to climbing ascents in the mountains. 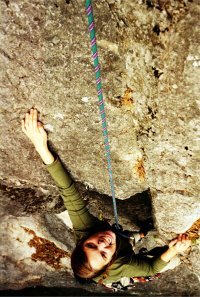 Multi pitch sport routes are like routes in sport climbing areas bolted and represent intermediate step between sport climbing areas and real alpinism in high mountain walls. Two very popular places like this exsist in our (slovenian) neighborhood Paklenica and Arco. Adventure in the true sense of the word, no auditorium in the remote world of vertical, where one forgets the time and gets aware of himself. I can take you to various walls and routes of different difficulties. From classic routes (Slovenian route, German route, Skalaška route, Aschenbrener route, ...) to modern routes that flirt with eighth grade. We can find special climbing charm in steep rock of Dolomites where III grade routes already are in the full vertical. In addition, the Dolomites are characterized with short access to the begining of the routes.